Previously we’ve mentioned how great today’s rates are compared to the past and we’ve broken down the cost of waiting to buy. But, what about selling a house? Maybe it’s time to move-up and buy for a growing family, or maybe you’re now empty nesters and it’s time to sell and move to a new location, or maybe you’re in a better financial position from when you bought your first home and now you’re ready for the home of your dreams. Whatever your situation, selling a house can be tricky. 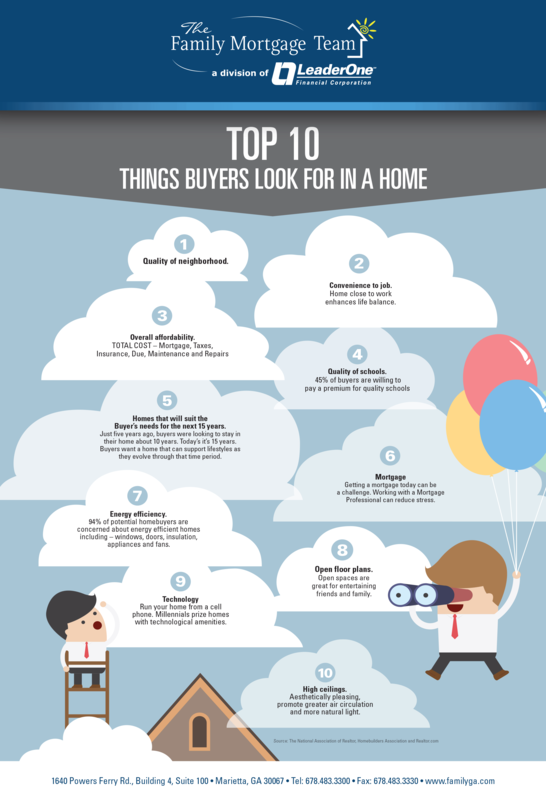 In our infographic below, we’ve listed the Top Ten Things Home Buyers Look For. And while the home you’re trying to sell may not meet all of these home buyer expectations, making yourself aware of these items and having an Agent who can help buyers visualize the home’s potential can certainly put you at better odds of selling quickly! 9. Technology– Run your home from a cell phone. Millennials prize homes with technological amenities.